.....this brilliant wall design created using sharpie markers? 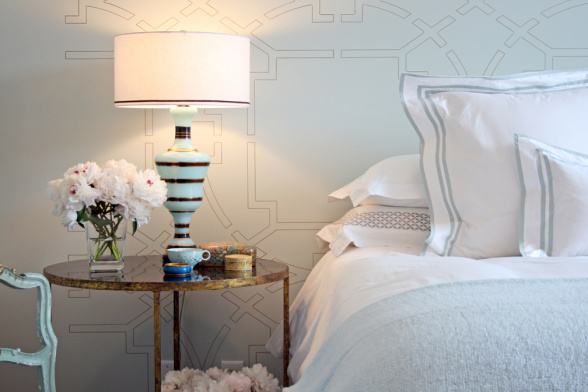 And said I had something similar in the works using this Katie Ridder wallpaper as inspiration? Or at least it could be finished. 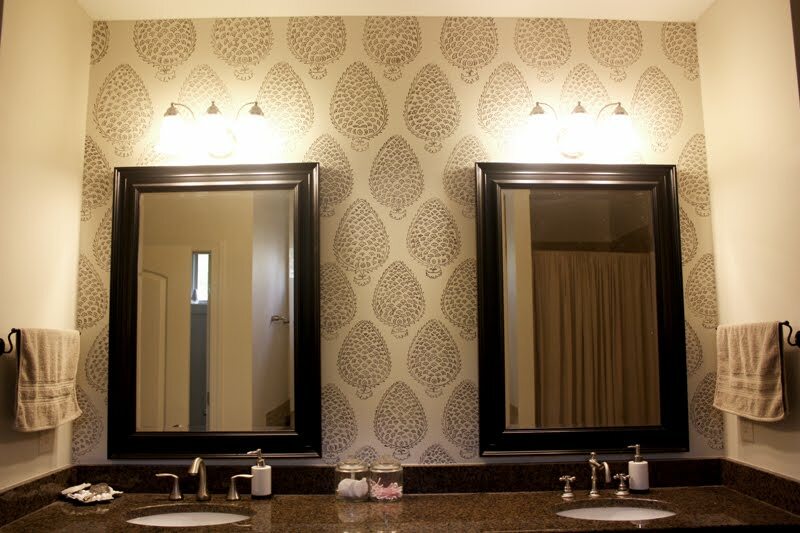 I'm trying to decide if I want to color in the outside border like the wallpaper that was my inspiration. I think it looks great as is...marker lines tend to show a lot when you colour areas in, so I'd leave it. Good luck explaining to your future little ones why they can't be drawing on the wall like mama did! That is so cool! You did a great job. I don't think I'd fill in the border. It looks finished the way it is. I'm TOTALLY impressed!!! Oh the possibilities! lol. Amazing!! Can you tell me where you got the overhead projector from? Can't find one anywhere!! Amazing! You have the best ideas! How did you line up the design? I am definitely on the look out for a an overhead projector!!! Genius!!!! I am in LOVE! Amazing job!!! That's amazing! It turned out so beautiful. How many sharpies did you use? Now I just need an overhead. My mom found the overhead at a yard sale for $5 after I had been trolling craigslist for months trying to find one. I lined up the design by drawing several "leaves" on my transparency the same distance from each other. 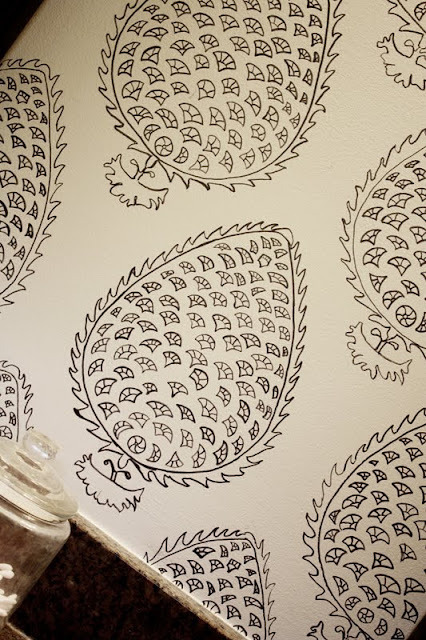 Then when I projected the design on the wall, I used the six leaves I had drawn to line everything up. Does that make sense??? Wow! You did such a great job! I even like your wall better then the wallpaper inspiration! This is AMAZING. The imperfections are perfect. I wish I had the guts to do it! WOW this is awesome! Love where you used it, too.. that is the perfect spot for it! I think it looks perfect as is.. Again, wow! This is so awesome. I would leave it as is. Random but why do you have 2 different faucets? Oh my goodness that is GORGEOUS!! Don't color it in...leave it...looks so amazing as is! Hi. I'm the PR and social media manager for Sharpie. OMG, this is amazing! I want this in my house. You have taken Sharpie into a whole new stratosphere. Who knew a little marker (along with a pretty amazing artist) could do such things. Really cool stuff. Thanks for letting us be a part of it! A-MAZ-ING! This looks so good! SERIOUSLY??? The PR and social media manager for Sharpie wrote on your blog??? How cool are you? Love the pics! They turned out great! Love love love love love!!!! :) You are a genius and a trailblazer. That is FABULOUS! How long did it take? I may have to do that in my 1/2 bath! You did a SUPURB JOB!!! What Patience you muct have. It looks so pretty! Fantastic! I love what you have done...any imperfections only add to the fabulous factor. No small feat, and it is beautiful! Well done! I tweeted this (general and to Sharpie) as well as putting on my Facebook fan page and based on the number of times it has been retweeted in the last two days, I would not be surprised if you end up with about 100 comments. Bet your traffic numbers have jumped dramatically!! Just. Beyond. Gorgeous. I saw it on someone else's twitter and had to see how it turned out! I completely agree with Patrick that any imperfections show that its hand done and add to that "couture" quality. I am getting ready to redo my God daughter's bedroom and now I want to figure out how/where I can incorporate this idea! Amazing!! I am so impressed!! Can you come to my house to play? You are a STAR! I am a Sharpie queen and I am attacking my closet this weekend!! Lovely. and, yes, I vote for coloring in! That is absolutely stunning. I would've never guessed you created it with a sharpie! I'm your latest follower! I'd leave it as is! Absolutely brilliant, and VERY inspiring! So happy I found you! 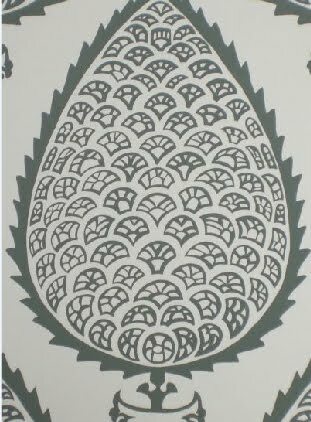 I thought it was the wallpaper!!! You must have some serious patience girl! this is awesome, awesome, aweseome! you hae inspired me. 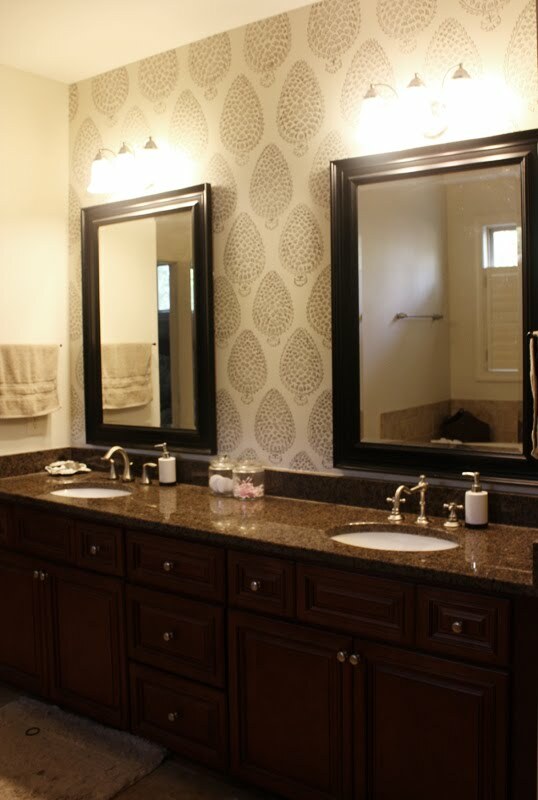 i want to do this to our bathroom now! i wonder how to get it pefectly straight, like you did though.. I admire your daring approach to a new idea! Good for you! It turned out lovely! I would leave it and not color it in. Looks awesome. This is an awesome idea! It looks so chic! I shall have to try this!! Wow, this is awesome! Ridiculously impressive. I love your whole bathroom. (I'm new to your blog - was tipped off by Jones Design Company but am loving what I see so far.) I'd vote for keeping it as-is. I think the not-filled-in border looks lovely. ummm WOW WOW WOW WOW WOW. This is brilliant. I am soooo loving this idea. Okay, I am so Loving all your ideas!! Your skills are impressive. Sweet! WOW. Speechless. How did you even make the first mark?!? Came here via Jones Design Co. I'll be back! Such a beautiful idea! I love how it turned out. Totally cool! Thanks so much for having the guts to show us this can be done! Very, very inspiring! Just beautiful! 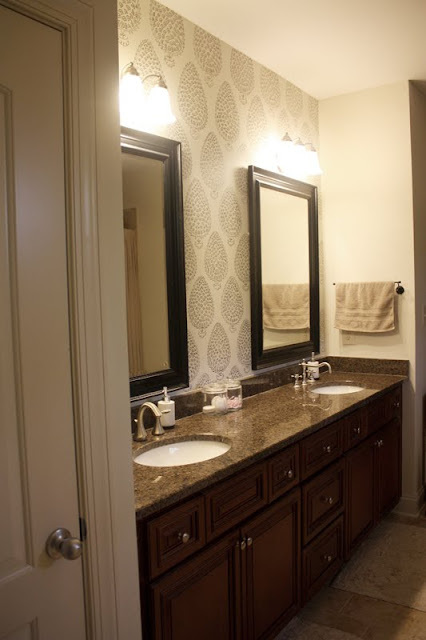 I linked this to my stenciling project post too so you'll have lot's more visitors coming here for a look. Well done! I bought my overhead projector at an art supply store. I paid $80 (Mine enlarges...) They start around $35 and go as high as your budget will allow. Wow, you are very talented! I love this...a sharpie?! WHoda thought, what a great idea, I may just have to copy you :) great job! Thanks for stopping by! I appreciate all your comments and love reading each one! Copyright Gus + Lula. All rights reserved.